Little do you non-librarians living in the U.S. know, but we librarians are ruling the world. Information is power, after all, and we control information. For instance, you probably think dinosaurs were big, stupid beasts who died millions of years ago. Oh, how silly of you. Or maybe you think there is nothing but water between our continent and the continents of Europe and Africa. Again, you are so silly. But we librarians like that you're silly and misinformed; it's how we keep you under control, at least until that nasty Alcatraz started stirring things up. 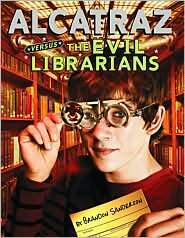 In Alcatraz Versus the Evil Librarians by Brandon Sanderson, Alcatraz, living in the librarian-controlled United States, was getting bounced from foster home to foster home. No parents could handle caring for a child who continually broke things. He claimed he couldn't control it; he was just clumsy, but could you handle living with a child who burns down kitchens, breaks valuables, and can't open any sort of door without breaking off the doorknob or handle? In the midst of a transfer from one family to another, Alcatraz is visited by his grandfather, whom he had never met. That's when things really started going downhill for us librarians. You see, Alcatraz had been content in the world we built for you. The world you grew up in, the things you're told, that's just how it is. Why would you think that guns were actually primitive weapons compared to swords? You're told the opposite, and we like it that way. And why would Alcatraz think that his clumsiness was actually a talent? Alcatraz gets a wake up call from his grandfather who fills him in on all the evil (supposed evil) that we librarians do and of the talent that Alcatraz possesses. It takes a bit of convincing, but eventually he and Alcatraz, and a handful of other crazy characters, begin a quest to get back something we stole from Alcatraz. Yes, it's true, we did steal from him, but he thought it was just sand. Silly Alcatraz, not all sand is just sand. I fear I'm making us librarians look bad, but you really should know that Alcatraz is a bad kid, too. Throughout Alcatraz Versus the Evil Librarians he continually states that he is not a good person. The fact that he published this book under the pseudonym Brandon Sanderson, and that he starts by saying he was tied to an altar of encyclopedias to be sacrificed but then doesn't finish that suspenseful story until the end of the book, really proves that he is cruel and evil. You'll have to make up your minds about Alcatraz and us for yourself when you pick up the book, but since it makes us librarians look bad, good luck finding it in your local public library, unless of course there is a rogue librarian there. And if there is a rogue librarian there, would you give us his or her name? We'd like to pay that librarian a visit.